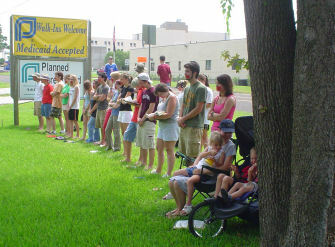 Anywhere from thirty to fifty people gathered daily in silence August 1st-5th crying out for God to rescue the unborn in Lufkin from the wickedness of Planned Parenthood. Partnering with Lufkin for Life and several local pastor and leaders I believe we saw a significant beginning of the end of this clinic’s negative influence in Lufkin! 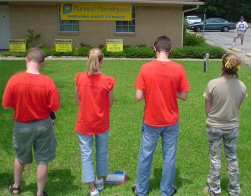 Every day we stood in faith believing God for nothing less than the shutting down of the clinic in Lufkin and the ending of abortion in America. I believe that we will see both. Making the front page of the local paper and the top story on television, we believe that the Silent Siege did make an incredible impact on the city. However, by far the greatest impact made was in the heavens as we allowed the voices of the unborn to be heard “even in our silence”. On Thursday during the Silent Siege several local pastors came and stood with us. It was incredible having the governmental leaders of the city join us in prayer. They really affected the spiritual realm moving angels and demons with their very presence I assure you! However, when the pastors arrived one of them had to be dropped off because he was disabled. A few minutes later the police arrived telling us that they had been called by a local business saying that protesters were filling up their parking lot. Later we found out from the business that Planned Parenthood had called them. The police left when we explained that we were parking over at a local church that had given us permission to park in their lot. On Saturday, August 6th I went out with the Bound4Life team to Lufkin’s “mother clinic” in Houston where they refer clients who want abortions. It made this all the more real for me standing in front of a clinic actually killing babies inside even as I stood. Oh–how I pray that God would end this thing! I was nineteen and in my sophmore year of college when I was raped by another student. During the few weeks that followed the traumatic violation of my body I became very sick, nausea and cramping were so severe that it caused me to miss work and classes. Finally, I related it to the possibility of pregnancy. I went to the local drugstore and bought a pregnancy test. When I got to my apartment I took the test immeadiately, and stared in disbelief as it showed a positive. I cried, not sure what to do next. 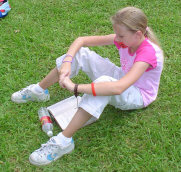 I felt the tremendous weight of responsibilty and I felt so alone. I decided to ask counsel from some of my professors that I had respect for. There were three different people that I sat down individually with to discuss my options. Each one had the same opinion. The ONLY solution was abortion. They said, “You have your whole life before you, your career will be ruined if you do not make the choice to terminate this ‘problem,’ Its not your fault!” I went to my apartment heavy-hearted, and once again feeling very alone. I decided that for the time being I would work and wait, but the pain grew daily until it was difficult for me to even stand. I finally went to see a doctor who told me I had a tubular pregnancy, and that if I did not abort immediately that as the baby grew the baby would die and I would too. I decided to get a second opinion. This life growing inside me I already felt endeared to, I was so distraught about what to do. The second doctor, and third had the same diagnosis, and only one option in their opinion. Upon the success of the Silent Siege the first week Lufkin for Life decided to extend the Silent Siege another week. Doing a sort of “surprise attack” this time around, they decided not to announce their coming with a press release. Amazingly, with no promotion, the first day 35-40 people showed up! There is no doubt that God is breathing on the movement of the Silent Siege right now! 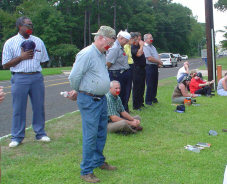 Several local congregations and ministries took the remaining days standing in prayer. 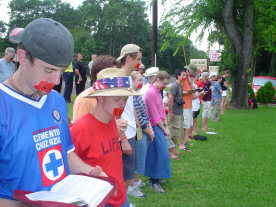 Lufkin for Life plans to continue the Silent Siege over the next few weeks as they feel led in prayer. Planned Parenthood Southeast Texas Security Chief keeps his eye on us. We were watched thoroughly every day. an impact sending people out from our internship, Fire in the Night. I just got news that two of the young people I led during the Silent Siege in Kansas City are know in their own home towns doing Silent Sieges. I am excited to see this message of the justice of the Lord for the unborn going forth all over our nation and all over the earth. Please pray for me as I continue to pray in the Night Watch here over the next few months. Thank you again! Your financial support and prayers are making this ministry of prayer possible.